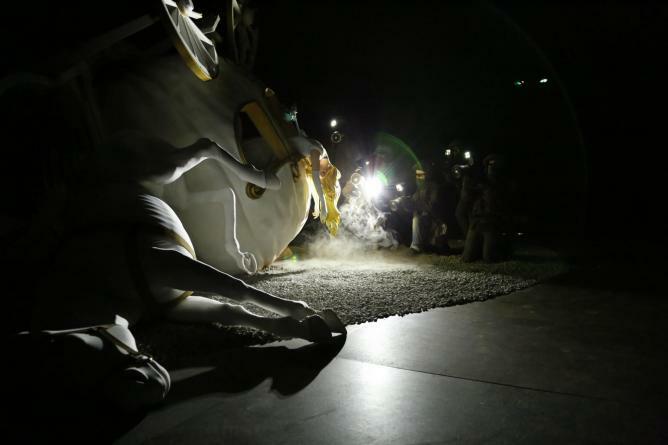 Crowds are swarming to Weston-super-Mare in South West England to visit Banksy’s latest artistic masterpiece, Dismaland — a horribly compelling theme park rife with satire, parody and lampooning. 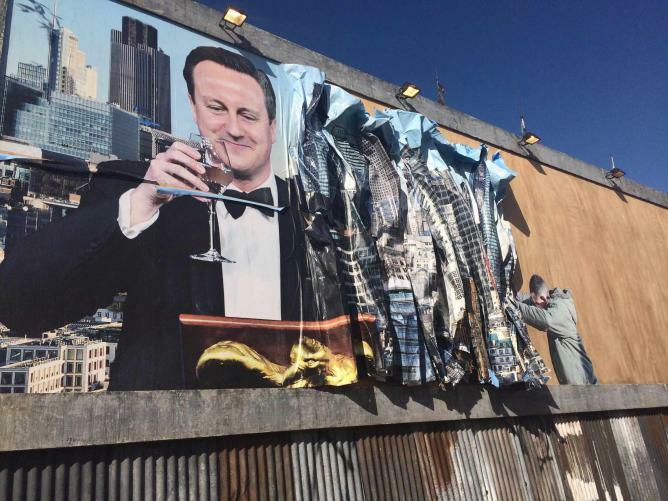 In true Banksy modus-operandi, the parks opening was kept under wraps until the day of its unveiling. Since then, the media has been swamped with reviews by critics on the parks merits and controversy. 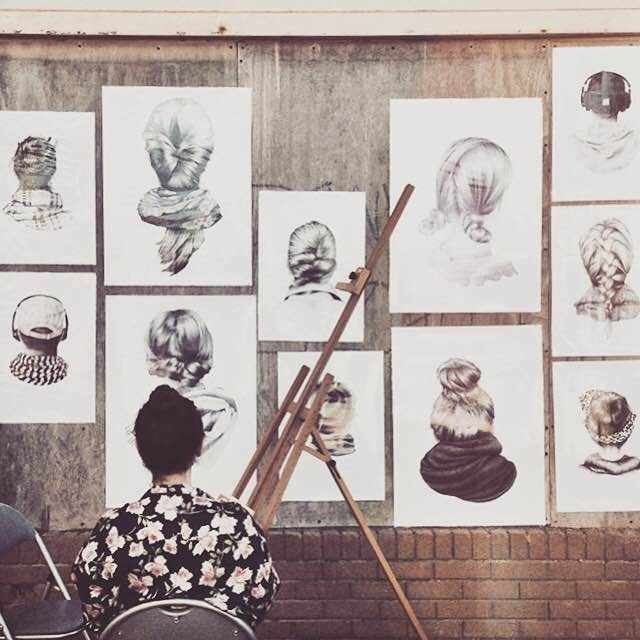 For the next 3 weeks, around 4,000 people per day are expected to visit the bemusement park, formerly the Tropicana lido, paying just £3 to enjoy some breakthrough pieces of art. Many believe that the beachfront theme park is just a rip-off of Disneyland, but knowing that Banksy, and the other 58 global artists who contributed to the exhibition have more creativity and excellence than that, we had to see the park for ourselves. 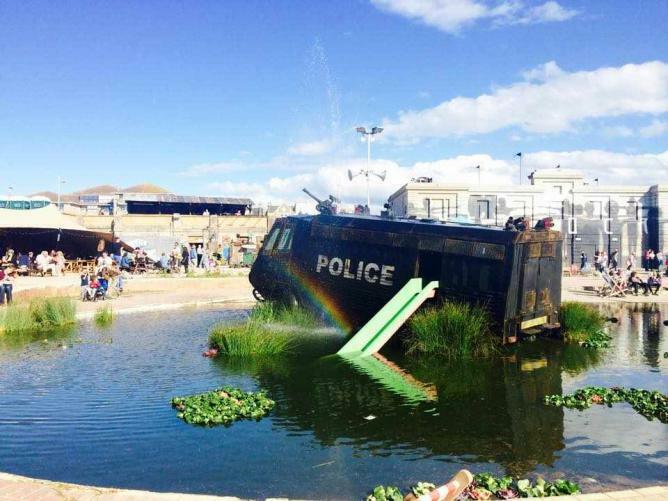 The 2.5-acre park is the graffiti artist’s biggest project to date, and Banksy himself has described it as ‘a festival of art, amusements and entry-level anarchism.’ It’s a bizarre extravaganza where the weirdness unfolds before you even enter the park. The park is nestled on the backdrop of a muddy beach with brown sea far into the horizon. Its dreary, grey exterior is all but welcoming and perfectly articulates the melancholy of the British seaside. As we queued to get past security, real and fake, we were met by a steward in mouse ears and a fluorescent pink jacket with the word ‘Dismal’ printed on the back. He advised us that Dismaland was a waste of our time, and we’d be better off visiting the local aquarium. It soon became apparent that all the attendants had been briefed to respond to every visitor request with a sullen, empty stare or a sarcastic remark. Entering the security gauntlet, resembling that of an airport and created by Californian artist Bill Bariminski, it comprises cardboard X-ray machines and security guards whose hats are made from duct tape. In true fashion, we take the whole procedure quite seriously at first, but we soon realised that these ‘guards’ take delight in humiliation — it wasn’t long before visitors were hopping on one foot and being shouted at for laughing uncontrollably. The whole experience was one of the highlights of our visit to the park. Within the festering wreck of a castle lies something as poignant as it is unsettling. If Disney were reimagined for the Princess Diana generation, then Banksy’s vast sculpture embodies exactly that. Inside a darkened room, a horror scene emerges. People gaze in bemused awe as Cinderella hangs lifeless from the window of her carriage that is now just wreckage on a road lined with paparazzi — whose flash bulbs create indoor lighting as they photograph her dead body — while two Disney-like birds try to redo the ties on her dress. If this isn’t upsetting enough, before entering the carnage, a steward asks you if you’d like to pose for a photograph against a green screen. Leaving the darkened room, a steward offers you a print of your photograph for £5 — it’s a picture of you and your friends smiling gleefully in the background of the massacre. How ironic. The entire piece is completely emotionless, even heart stopping. You feel the urge to look away, but there’s a part of you that just can’t. The entire park is steeped in irony and biting satire, some of which is lost on many visitors. 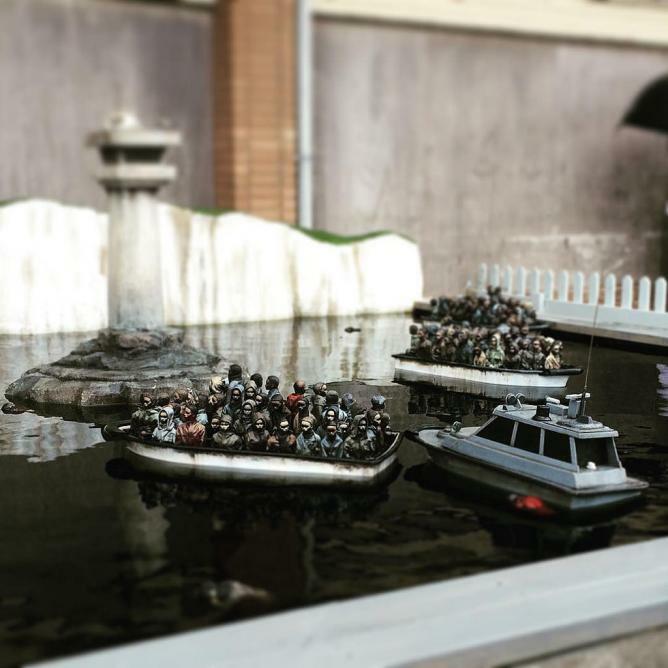 A large pool filled with remote controlled boats sits in one corner of the park. Visitors feed £1 coins into the slot for a chance to drive a migrant boat towards the White Cliffs of Dover, carefully dodging the bodies floating in the surrounding water. Whichever way you turn the boat, there are always faces looking at you — distinctive faces, with their own expressions and characteristics. A cabin near the decrepit children’s play area advertises ‘Payday Loans 4 Kids: get an advance on your pocket money today.’ Inside, the artist has created specialised toys, exclusive to his store, such as Post-Traumatic Stress Action Man and a pregnant baby doll. The only way for children to view the company’s punitive interest rates is by bouncing on a trampoline. While standing at the counter, the lady next to me said, ‘Wow, it works just like the regular Payday Loans!’ The sales advisor, who was the artist himself, smirked at us. Aside from the many sculptures, there are three galleries (worth the entrance fee ten times over) featuring a fine collection of art that is in keeping with the themes evident in the park. 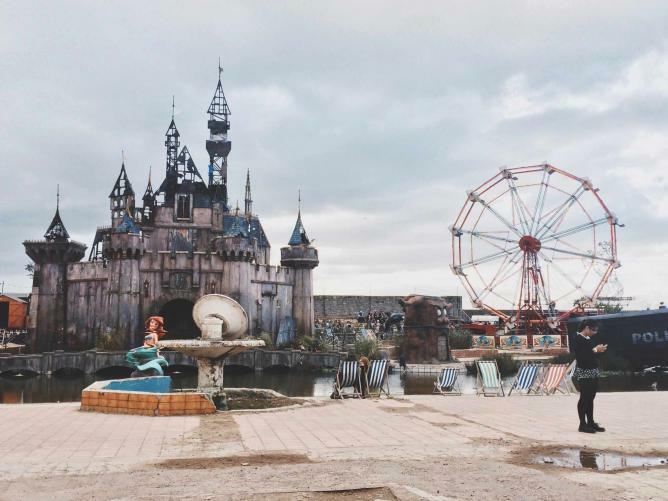 Banksy commented that Dismaland is ‘a theme park whose big theme is — theme parks should have bigger themes.’ Certainly, when entering the park, visitors become excited by the carousel, the ferris wheel, the castle and the array of fairground games, only for their brain to then register that something is not quite right — everything, in fact, is entirely wrong. In addition to the galleries, there is a small outdoor cinema running films from Greenpeace, Ecotricity and Black Sheep Films. The social experiment has proved a triumph, and Banksy seems to have surpassed his youthful anarchy through street art established on the streets of Bristol, becoming instead — along with the artists who helped create Dismaland — a forerunner for social change.